My first ever surgery: about 16 years ago (from 11/17/13), this (brachial basilic arterio-venous fistula) was my very first surgery I’ve ever done in my life. It was a strange way to start because the technical aspects of this surgery is high – I still consider it difficult. But I was a lowly surgical intern in Cleveland, and highly respected transplant surgeon, Dr. James Schulak, was doing the surgery. I was just retracting (Surgical Interns didn’t operate, they just held things), but during the case, Dr. Schulak was time-pressed and accidentally I got showered in the face with blood – blood dripping down my face, luckily it didn’t hit me in the eye (I love wearing glasses). He told me to get out, clean up. When I leisurely (I took my time getting all the blood off) made it back to the surgery after wiping off my face and changing. I saw that he was just waiting for me without having made any progress in the surgery. He was just sitting there without moving – bizarre. He said he had a policy: if he splashed a resident with blood, the resident gets to do the entire case. So, that’s how I did my first surgery. It took about 2 more hours, and I didn’t even know how to hold the specialized vascular instruments (given that I hadn’t even done any surgeries at all), but he guided me expertly through it, I managed to do it, and the patient had a great result. In Modesto, the operation would have taken me about 30 minutes – but we all had to start somewhere. 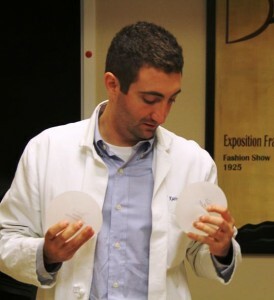 I sorta miss these cases (and my crazy method I personally innovated for laparoscopic peritoneal dialysis catheters). Now, with a cosmetic surgery practice, I’m focused on my Modesto Botox Patients, Veins and Acupuncture. When I used to make these brachiobasilic AV fistulas, I did them in one stage which included a pretty long incision from axilla to antecubital fossa, my theory was that I would spare the patients two trips to the operating room. There’s a theory out there that separating the operation into 2 stage approach is better in case the fistula doesn’t mature. Stage One: make the anastamosis (connection between vein and artery), and Stage Two: mobilize the basilic vein to the surface (because it is deep and not easily accessible from a dialysis standpoint). 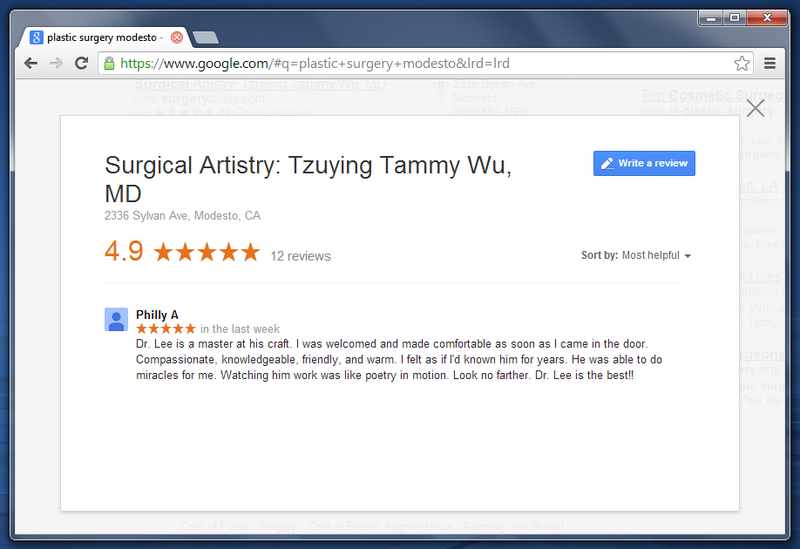 Dr. Fung of Modesto very kindly helped me improve my technique for these vascular procedures – he is the master. I was on a small-ship cruise a few years ago, and my family became friendly with this older couple. The woman asked what I did for work, and I told her I was an NP. She said her husband had created some medical devices – his name was Wayne Quinton. He also invented the first dialysis machine. He’s up in his 90s now and still tinkers with inventions. This entry was posted in Uncategorized, Veins and tagged blood, first surgery, Fistulas, Lit Fung, Modesto on November 17, 2013 by Calvin Lee, MD. How soon after vein procedure do I see results? I got this question today and I thought I’d try to answer this question. How long after I START vein procedures will I be happy with the BEST reasonable results? Reasonable results = 90% improvement from baseline. It might be 6 months later after starting vein treatments and about 3-4 sessions of sclerotherapy (vein injections) and vein laser mixed in, and about $1500 spent. And after sclerotherapy, I don’t want patients to experience vigorous exercise for about 9 days after the procedure. Stockings after sclerotherapy is a must for those 9 days as well. But after vein procedures, the after care is easier: no stockings needed, and minimal restrictions on the exercise. Most patients do fewer than the 3-4 to get the greatest results in 6 months. Many take their time and do 3-4 procedures over 2 years. But after each procedure, there may be about a 2-3 month recovery time depending on several factors. And after each session, I’m hoping for 30-50% improvement. I perform an ultrasound with duplex to see if there is reflux in some of the slightly deeper veins. If these veins have reflux, I consider the surface veins as a possible side effect of these veins on the inside. Most of the time, I believe that insurance covers the treatment of the refluxing veins. This is usually done via endovenous ablation with laser or radio frequency in the office/surgicenter setting or it can be done with vein stripping at a hospital setting. I have done laser ablation in my office; however, I’ve stopped taking insurances and if our ultrasound test shows that you have what I called a “medical vein issue” then I’ll make some recommendations for practitioners who take insurance, and after these veins are taken care of. We can deal with the cosmetic vein issues. However, about 30-60% of the time, I’ve seen much of the cosmetic vein problems subside after the medical vein problems have been solved or improved upon. This entry was posted in Laser, Modesto, Veins and tagged endovenous ablation, spider veins, varicose veins, vein stripping on July 2, 2013 by Calvin Lee, MD. Sometimes teaching is a great way to learn and we just had a wonderful opportunity to teach and learn. We were honored to have Dr. Edward Katime in our office learning about Plastic Surgery (including breast augmentation procedures), Botox, fillers (Juvederm), Veins (Sclerotherapy and Laser), and Acupuncture. We always feel that we learn a lot from having students in our office and as always, we learn a ton from our patients. He spent 4 days with me and we are very thankful for the patients who participated in our educational process at our office in Modesto, CA. He is a UC Davis affiliated family medicine resident in his last few months of his training. He is about to become a full fledged doctor. He is also, like me, from New York City. He also loves Modesto, CA. And works at Doctors Medical Center. He had excellent questions and our patients liked him very much. I have a feeling that he is going to do very well. I have been given the title of Assistant Professor from UC Davis and at one point I was even given a teaching award for this position as “the outstanding” community MD teacher. I really don’t do enough to deserve the award, but sometimes I wish I could do more. We wish Dr. Katime a bright future in medicine! 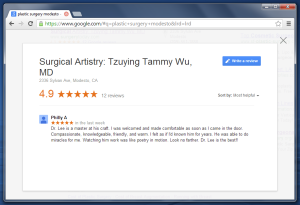 This entry was posted in Acupuncture, Botox, Cosmetic Surgery, Education, Fillers, Skin Care, Veins and tagged family practice, residents, teaching, UC Davis on May 8, 2013 by Calvin Lee, MD.